World Trade Center Istanbul started the first of its “Business and Investment Opportunities” seminar series with Indonesia. 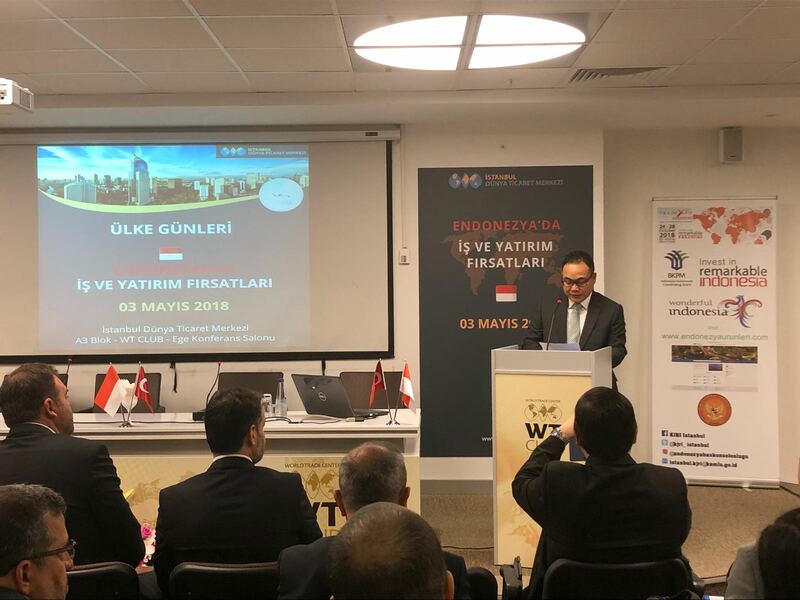 Seminar took place at WTC Istanbul’s award-winner WT Club offices, on May 3rd, and welcomed Indonesia Istanbul Consul General Mr. Herry Sudradjat, Indonesia Minister Counsellor Mr. Toary Worang, and Turkish textile retail giant LC Waikiki’s Deputy General Manager Mr. İlker Hacıoğlu as speakers. Around 80 businessmen participated the event, representing several industries such as food, construction, tourism, electronics, furniture, airline carriers, and cosmetics. Consul General Mr. Herry Sudradjat gave the opening talk, followed by WTC Istanbul Deputy General Manager Türker Karpuzoğlu and the presentation of WTC Istanbul Foreign Affairs Department about our activities. Mr. Herry Sudradjat took the microphone second time to give a detailed speech about ‘Why Indonesia and Why Now?’, covering several topics on doing business in Indonesia, also introduced Indonesia’s main export and import products. Following speech of Mr. Hacıoğlu from LC Waikiki brought the participants to a deeper and more experience side of operating a business in Indonesia, as well as general market insights. LC Waikiki is a textiles retail chain that operates 850 stores around the world, which 4 of them are in Indonesia capital Jakarta. Mr. Hacıoğlu touched on valuable subjects about what to expect in Indonesian market, advantages of doing business in Indonesia, and tips for newcomers. Q&A session got tremendous attraction and lasted more than 2 hours. As the seminar ended, Mr. Karpuzoğlu handed gifts to all three speakers and extended our gratitude. Our seminar series on “Business and Investment Opportunities” will continue with other countries, with distinguished guests that include officials and industry professional that would provide practical knowledge and insights on the market that would be covered.